The DAS-BPMC adapters allows you to your PMC with a new PC. The new PCÂ´s have PCI Express connectors in larger quantities than PCI slots. The DAS-BPMC-X1 ( PCIe Bridge PMC 1 slot) adapter / carrier converter card provides the ability to install one PMC card into a standard PCIe (Express) 4 lane slot. Suitable for PCI or PCI-X operation with the PMC; 32 bit or 64 bit data and PCI (25, 33, 50, 66) or PCI-X (50,66,100,133) MHz. clock. Auto selected or switch programmable speeds. The bridge can operate with 1, 2, 3 or 4 lanes active, and can be installed into slots with more than 4 lanes if desired. 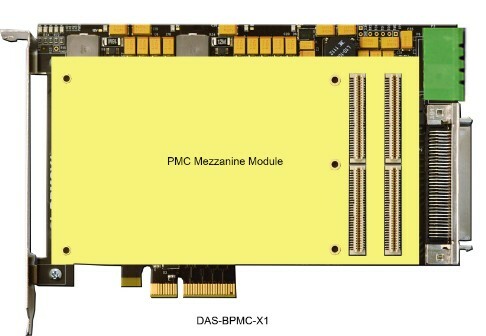 The DAS-BPMC-X2 ( PCIe Bridge PMC 2 slot) adapter / carrier converter card provides the ability to install two PMC card into a standard PCIe (Express) 8 lane slot. XMC Bezel IO supported at PCIe bracket. Jn4 / Jn6 "user IO" supported with either SCSI or DIN connectors at both positions. See Panduit for mate [120-964-455] or standard SCSI II connector.